It’s a monster film’s homage with lots of man-eaters slugs and loads of blood , including revolting , repulsive scenes. This chiller with middling budget packs thrills, chills , some good action , gore , horror and few funny moments. It’s a hybrid of monster movies from the 50s and modern American production in B series style . People are dying mysteriously and terrifyingly , and nobody has a track what the cause is . Only health inspector named Mike Brady (Michael Garfield) finds a possible origin , but his theory of murderous slugs is laughed at by the authorities . When his wife named Kim (Kim Terry) is attacked , he discovers that spilled toxic waste is being helpfully cleaned up by the slug population and causing countless deaths . Only when the slugs are mutating into blood-thirsty man eaters and the body count begins to rise , the police goes into the action . A slug expert from England begins snooping around does it begins to think Mike had the right idea after all. 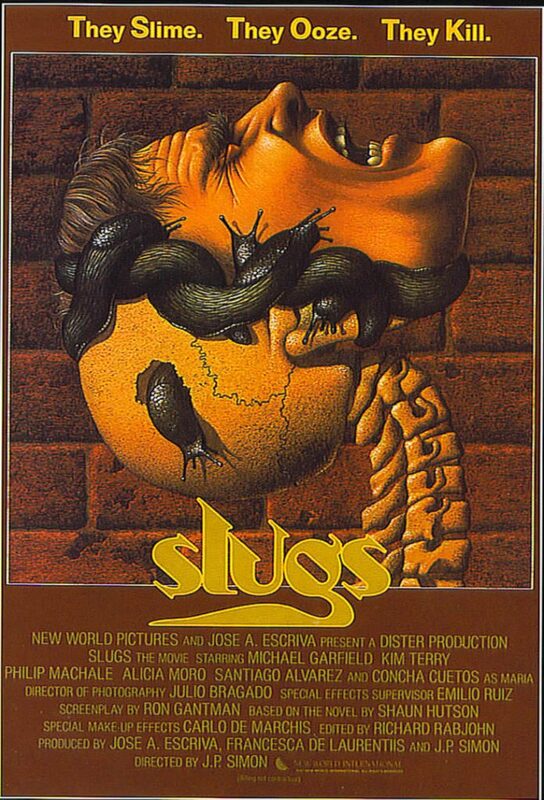 This humdrum adaptation based on Monster movies from the 50s results to be a special version based on the bestseller titled ¨Slugs¨ by Shaun Hutson with screenplay written by also producer José Antonio Escrivá , Ron Gantman , and the same director Juan Piquer Simón (as J.P. Simon) . The thrilling screenplay is a bit yawn-inspiring but nifty special effects will keep you from dozing off , its author is Emilio Ruiz , he’s a nice creature effects designer, a perfect craftsman who made effects , monsters , miniature and matte shots in ¨Pan’s labyrinth ,The Devil backbone , Dune , Conan , Cat’s eye¨ and many others . There’re gruesome killings , rip-roaring action , thrills , chills and results to be briefly entertaining . Plenty of repellent images , it was X classified in England and was banned in the Australian state of Queensland until the early-’90s when the Queensland Censorship Board was disbanded . Average main cast with unknown actors as Michael Garfield and Kim Terry . There appears usual secondary actors seen in co-productions of the 60s and 70s , Spaghetti and Terror genre , as Frank Braña , Manuel De Blas and Patty Shepard . It’s a slight fun with acceptable special effects by Emilio Ruiz Del Rio supported by Benito Cortijo and Juan Mirame , passable set decoration , functional art direction and none use of computer generator . The slugs monsters are the real stars of this production , being rightly realized , some of them are authentic Asturias (Spain) slugs and others are made by plastic miniature ; it has numerous “older technique” special effects such as matte paintings, rubber-suited monsters, Piquer uses the standard film technique of reverse-footage to create certain effects . The fable is silly and laughable ,though the effects and action are professionally made . Among the most spectacular of its visuals there are some deeply shrouded caverns , several monsters roaring menacingly towards the camera , the colorful backgrounds of the sewers and slaughters and massacres committed by the horrible slugs . On the whole this is a suspenseful and tense thriller especially at the amazing ending tableau when Michael Garfield and his helper have to tackle the massive slugs at the lair in the final . Some scenes are clumsily shot but the movie has some good moments here and there . Some illogical parts in the argument are more than compensated for the excitement provided by the slugs , though sometimes are a little bit cheesy . Highlights of the story includes a roller-coaster ending , some terrifying frames in a restaurant and many others . Functional cinematography by Julio Bragado , being filmed the interiors in Madrid and exteriors in Lyon , (New York) , a population about 5.000 inhabitants . The motion picture was middlingly realized by Juan Piquer Simon . Piquer who recently passed away was a good craftsman , he owns his own studio and created and/or designed many of the simple special effects sequences you see in any of his many imaginative undertakings . Juan who was director of the Mostra of Valencia (Spain) , displayed a professional career and specialized on all kind of genres as Terror (Slugs, Piezes , Cthulhu ) and Sci-fi (The rift , The new Extraterrestres, Supersonic man) and made some adaptations about Jules Verne novels (“Fabulous Journey to the Center of the Earth” , “Mystery on Monster Island”) . While his films have been universally panned by the prestigious reviewers, they have a kind of quality that must be endured to be fully appreciated .